To use the idea of crossing a bridge to help children grasp new opportunities despite their reservations and fears (SEAL themes 1: New beginnings and 7: Changes). You will need a skipping rope and balance beam. Before the assembly, set up the balancing beam and lay the rope on the floor. At the start of the assembly, ask for volunteers to walk along the beam, keeping their balance. Ask those watching to compare how the children walk along the beams – arms out, slowly, quickly, looking ahead and so on. Explain to the children that you are going to show them a number of well-known bridges – either they are famous or they are known for their beautiful design. You may like to have a vote as to which is their favourite design. If using the images suggested for step 3 above, first show Tower Bridge in London. Note that some of the children may have seen it. Next, show the image of the bridge in Angola. Note the modern look of the bridge compared to the surrounding houses. Third, show the image of the bridges in Dartmoor, Devon. Again, the children may well have seen bridges like this. Fourth, show the railway bridge in Porto, Portugal. Finally, show the bridge in Iraq. Explain that you are now going to show some other bridges and you want to know how the children would feel about walking across these! Stop after each picture to listen to the reactions of a few children. In turn, if using, show the images suggested for step 4 above. First, show the Seven Mile Bridge in Florida. Second, the bridge over icy water. Don’t slip! 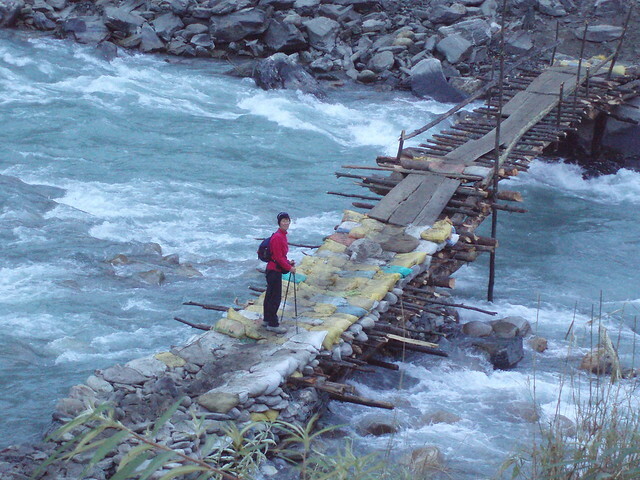 Third, the bridge crossing a river in Nepal. Finally, a bridge in Afghanistan. Explain to the children that, in life, there are emotional and mental ‘bridges’ we need to cross to move on from one stage in our lives to another – they may be moving house, moving into a new class or new school. Sometimes these bridges can seem exciting ones to cross, but sometimes we can feel frightened by them. No matter how we feel, crossing the bridge is essential if we want to move on to the other side and experience all the things that are in store for us there. Point out the places children are moving on to at present – new school, new class, moving house. Explain that these can feel like both exciting and frightening experiences, but there are people to help us cross the bridges and, once we have moved on, we will find that things often seem even better on the other side! Take time to think about those children who are new at the school or moving to other places to live or simply moving up into other classes. Ask the children to think about how we could each make it easier for them to cross their bridges to those next stages in their lives. Take a moment to thank God for them and what they mean to us. Ask the children to make a decision to help them in any way they can, to make the transition easier for them. You might like to ask the children if they would like to write the names of those ‘crossing a bridge’ on pieces of paper for other children to read out loud at the place indicated in the following prayer. Thank you for those around us and for the difference we can make to each other’s lives. Please be with (read out names) as they start school here/move house/move class. Thank you that you are always with us wherever we go.